World of Warcraft launched eight years ago, and MMORPGs still don't know what to do with themselves. It's no longer enough to just clone WoW, if it ever was, and the genre's massive shift toward a free-to-play revenue model has developers scrambling to reinvent yesterday's premium games as sufficiently alluring freebies. 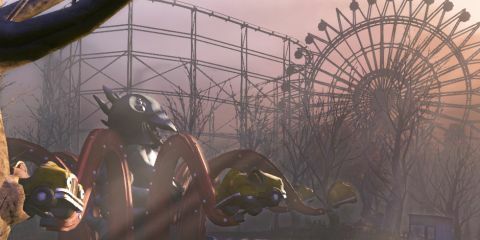 The Secret World, Funcom's latest MMORPG, boldly aims for the ever-shrinking premium space, hoping to justify its monthly fee with an utterly unique setting and theme. It doesn't quite, at this early stage, despite being an undeniably interesting effort. TSW takes place in the modern day, only in a skewed universe in which every myth, legend, and conspiracy theory is utterly, horribly true. This heightened reality serves as the backdrop for a millennia-spanning struggle between three secret societies: the craven, amoral Illuminati, the rigid, authoritarian Templars, and the chaotic, mysterious Dragon. As a new agent of your chosen faction, you'll bring your newfound paranormal abilities to the aid of your masters' agenda. This is a very cool concept, and Funcom's writers have a ton of fun tossing in scads of far-out ideas just to see what sticks. Collectible lore items fill in the backstory, but much of the best color comes via the quest-giving NPCs, who are veritable chatterboxes. The dialogue tends toward overwritten and pulpy, but it's hard to feel too cross when there are moments of brilliance, such as writing the Illuminati as crass Hollywood hedonists. TSW’s atmosphere is utterly singular, and purple prose is preferable to the more common alternative of uniform, juvenile mediocrity. Character flexibility is second to none, but with 525 abilities to choose from it takes a lot of time and effort to come up with a decent build that properly exploits the synergies between certain weapon and ability combos. Our eyes nearly glazed over the first time we explored the wheel-like interface that holds all those abilities, and we lunged for its built-in search engine like a life preserver. A little patience and a can-do attitude got us past the initial info overload, but it’ll be nice if Funcom comes up with a more user-friendly way to access all this crucial info at some point. A web-based build calculator would be a great start. Description TSW takes place in the modern day, only in a skewed universe in which every myth, legend, and conspiracy theory is utterly, horribly true. This heightened reality serves as the backdrop for a millennia-spanning struggle between three secret societies: the craven, amoral Illuminati, the rigid, authoritarian Templars, and the chaotic, mysterious Dragon. As a new agent of your chosen faction, you'll bring your newfound paranormal abilities to the aid of your masters' agenda.